The neighborhood of Upper Forest/Sheppard’s Knoll/Ocean Pines within the gates of Pebble Beach, is comprised of both single family homes in the upper Del Monte Forest as well as condos within the Shepard’s Knoll and Ocean Pines complexes. Homes in the Upper Forest often have large lots and sweeping ocean views due to their high elevation. With quick access to Highway 1, Carmel and Monterey are just minutes away as well as world famous golf courses, restaurants and Pebble Beach events. Scenic Drive borders the neighborhood to the east, near The Community Hospital of the Monterey Peninsula (CHOMP) which has a reputation for excellence. 17 Mile Drive borders the neighborhood to the west. To the north lies the entrance to Huckleberry Hill Nature Preserve and to the south is the Hwy 1 Pebble Beach gate. Shepherds Knoll is a perfect community for those who like a smaller carbon footprint and the ease and convenience of condo living. Located on 17 mile drive in a serene forest setting, it is a doubly protected gated community within the exclusive gates of Pebble Beach. Units in this complex have forest and often very nice ocean views, to be enjoyed from your private balconies. 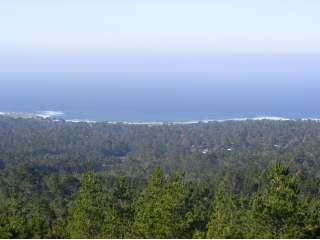 Ocean Pines condominium complex is located through the Highway One gate to Pebble Beach along Scenic Drive. Residents enjoy sweeping ocean views amidst the towering pines and all the conveniences of condo living. Click here to preview all homes for sale in Pebble Beach in the Upper Forest/Sheppard’s Knoll, Ocean Pines neighborhood. To preview all Pebble Beach real estate available click on the link. In 2018, 21 homes sold in this neighborhood. The most expensive home that sold, sold for 1.81 million for a 3 bedroom, 3.5 bathroom home with 3,725 SqFt of living space on a 14,000 SqFt lot. The least expensive home sold for 610K for a 2 bedroom, 2 bathroom condominium with 1,245 SqFt of living space with peeks of the bay. In 2017, 22 homes sold in this neighborhood. The most expensive home that sold, sold for 1.7 million for a 4 bedroom, 3.5 bathroom, custom Mediterranean home with 3,947 SqFt of living space on a 13,504 SqFt lot. The least expensive home that sold, sold for 515,700 for a 2 bedroom, 2 bathroom, end-unit condominium, 1,537 SqFt of living space with forest and Ocean views. 22 homes sold in this neighborhood in 2016. The most expensive home sold for 1.58 million for a 4 bedroom, 4.5 bathroom, 4,764 SqFt home with Ocean views on a 10,012 SqFt lot. The least expensive home sold for 502K for a 2 bedroom, 2 bathroom, 1,400 condo in the the gated Shepards Knoll community. 19 homes sold in 2015 in this neighborhood. The most expensive home was a 1.75 million custom estate with 4 bedrooms, 4 full and 2 half bathrooms with Ocean views and 3,559 SqFt of living space on a 11,960 SqFt lot. The least expensive home to sell was a 2 bedroom, 2 bathroom, 1,495 SqFt condominium that sold for 400K. In 2014 there were a total of 20 homes sold in this neighborhood. The most expensive home was a 5 bedroom, 5.5 bathroom newly constructed, bank owned home with 4,221 SqFt of living space on a 14,852 SqFt lot, which sold for 1.8 million. The least expensive was a 2 bedroom, 2 bathroom, 1,492 SqFt condo on a 1,896 SqFt lot, which sold for 451K. There were 22 homes sold in the neighborhood in 2013. The most expensive home sold in 2013 was a 2,200 SqFt home on a 11,249 SqFt lot, which sold for 1.22 million. The least expensive home sold in 2013 was a 1,340 SqFt Ocean Pine condos, which sold for $407,000. In 2012 the most expensive home sold in the neighborhood sold for $1.275 million and was a newly constructed 2,800 SqFt home situated on .25 acres. The least expensive home sold in the neighborhood was a $380,000, 2 bedroom 2 bathroom condo located in the Ocean Pines complex. For a detailed analysis of Pebble Beach real estate sales, check out our monthly Community Market Reports. To live in the Upper Forest, Shephard’s Knoll or Ocean Pine communities, is to live within the beauty of the Del Monte Forest. Your convenient location allows you the freedom to quickly access Carmel for shopping or a concert at the Sunset Center, or perhaps Monterey for fresh seafood and a stroll down historic Cannery Row. With miles of forest trails, you can explore the magic of the forest on foot, walking back home to enjoy a spectacular sunset as the blue Pacific deepens into a dark purple. Living in the forest is tranquil and relaxed, with great accessibility and convenience. Your home is a perfect escape from life’s frantic pace and for getting in touch with the natural splendor of the area.